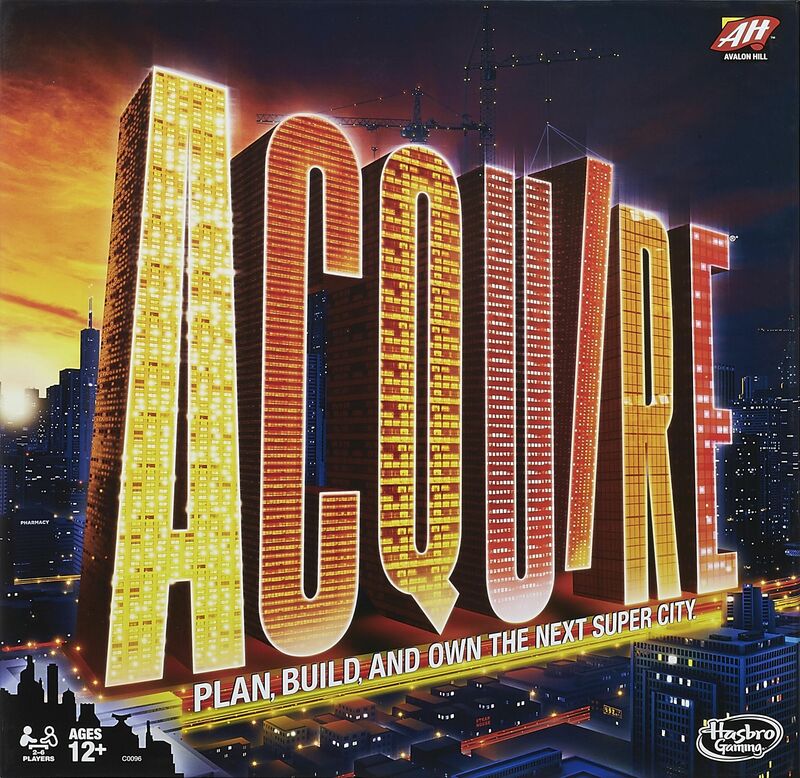 In Acquire, each player strategically invests in businesses, trying to retain a majority of stock. As the businesses grow with tile placements, they also start merging, giving the majority stockholders of the acquired business sizable bonuses, which can then be used to reinvest into other chains. All of the investors in the acquired company can then cash in their stocks for current value or trade them 2-for-1 for shares of the newer, larger business. The game is a race to acquire the greatest wealth. This Sid Sackson classic has taken many different forms over the years depending on the publisher. Some versions of the 3M bookshelf edition included rules for a 2-player variant. The original version is part of the 3M Bookshelf Series. Note: many books and websites list this as a 1962 publication, probably due to the copyright date on the cover of the original box. This is incorrect; information from Sid Sackson's diaries, correspondence, and royalty statements prove that it was published in 1964. However, for some reason admins continue to accept "corrections" of the publication date to 1962. A detailed timeline of the development and publication of the game can be found at https://opinionatedgamers.com/2014/05/29/how-acquire-became-acquire/, for those interested.